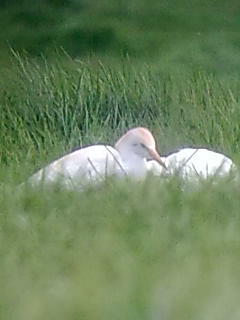 Not Another Blogging Birder: Cattle Egret Update! Only a phonescoped shot as it's impossible to get close enough for a DSLR photo. Having seen 7 Cattle Egret from Tower Hide on Good Friday I thought I'd check their Colyton haunts as people had expressed concern that they'd left us. Pleased to say all 7 were about Easter Sunday but using different areas to feed as there are now more cows outside plus the growing/insect season is now getting going. (Apparently they like grasshoppers). Yesterday (B.H. Monday) I decided to avoid the crowds on Coly Common watching the Whinchat and 20 Wheatears (as per I.McLean) and head down to Seaton Marshes. I had 3 Common Sandpipers in the channel from the hide plus 4 Wheatear (2 rusty roller, 2 by lagoon). There were also 3 Sedge Warbler there. Whimbrel were still about, the most I've seen is 4. Reed Warblers are also in along track to Tower hide. This morning (18th) IMc finally got some reward up Beer Head with Pied Flycatcher and several Redstart. At last - but too late for Easter!